NASA is working to resume science operations of the Hubble Space Telescope after the spacecraft entered safe mode on Friday, October 5, shortly after 6:00 p.m. EDT. Hubble’s instruments still are fully operational and are expected to produce excellent science for years to come. Hubble entered safe mode after one of the three gyroscopes (gyros) actively being used to point and steady the telescope failed. Safe mode puts the telescope into a stable configuration until ground control can correct the issue and return the mission to normal operation. Built with multiple redundancies, Hubble had six new gyros installed during Servicing Mission-4 in 2009. Hubble usually uses three gyros at a time for maximum efficiency, but can continue to make scientific observations with just one. The gyro that failed had been exhibiting end-of-life behavior for approximately a year, and its failure was not unexpected; two other gyros of the same type had already failed. The remaining three gyros available for use are technically enhanced and therefore expected to have significantly longer operational lives. Two of those enhanced gyros are currently running. Upon powering on the third enhanced gyro that had been held in reserve, analysis of spacecraft telemetry indicated that it was not performing at the level required for operations. As a result, Hubble remains in safe mode. Staff at NASA’s Goddard Space Flight Center and the Space Telescope Science Institute are currently performing analyses and tests to determine what options are available to recover the gyro to operational performance. Science operations with Hubble have been suspended while NASA investigates the anomaly. An Anomaly Review Board, including experts from the Hubble team and industry familiar with the design and performance of this type of gyro, is being formed to investigate this issue and develop the recovery plan. If the outcome of this investigation results in recovery of the malfunctioning gyro, Hubble will resume science operations in its standard three-gyro configuration. If the outcome indicates that the gyro is not usable, Hubble will resume science operations in an already defined “reduced-gyro” mode that uses only one gyro. While reduced-gyro mode offers less sky coverage at any particular time, there is relatively limited impact on the overall scientific capabilities. NASA continues to work toward resuming science operations of the Hubble Space Telescope after the spacecraft entered safe mode due to a failed gyroscope (gyro) on Friday, Oct. 5. Following the gyro failure, the Hubble operations team turned on a backup gyro on the spacecraft. However, that gyro did not perform as expected, reporting rotation rates that are orders of magnitude higher than they actually are. This past week, tests were conducted to assess the condition of that backup gyro. The tests showed that the gyro is properly tracking Hubble’s movement, but the rates reported are consistently higher than the true rates. This is similar to a speedometer on your car continuously showing that your speed is 100 miles per hour faster than it actually is; it properly shows when your car speeds up or slows down, and by how much, but the actual speed is inaccurate. When the spacecraft turns across the sky from one target to the next, the gyro is put into a coarser (high) mode. In this high mode it may be possible to subtract out a consistent large offset to get an accurate reading. However, after the large turns are over, the spacecraft attempts to lock onto a target and stay very still. For this activity, the gyro goes into a precision (low) mode to measure very small movements. The extremely high rates currently being reported exceed the upper limit of the gyro in this low mode, preventing the gyro from reporting the spacecraft’s small movements. Following the gyro failure, the Hubble operations team turned on a backup gyro on the spacecraft. However, that gyro did not perform as expected, reporting rotation rates that are orders of magnitude higher than they actually are. This past week, tests were conducted to assess the condition of that backup gyro. The tests showed that the gyro is properly tracking Hubble’s movement, but the rates reported are consistently higher than the true rates. This is similar to a speedometer on your car continuously showing that your speed is 100 miles per hour faster than it actually is; it properly shows when your car speeds up or slows down, and by how much, but the actual speed is inaccurate. When the spacecraft turns across the sky from one target to the next, the gyro is put into a coarser (high) mode. In this high mode it may be possible to subtract out a consistent large offset to get an accurate reading. However, after the large turns are over, the spacecraft attempts to lock onto a target and stay very still. For this activity, the gyro goes into a precision (low) mode to measure very small movements. The extremely high rates currently being reported exceed the upper limit of the gyro in this low mode, preventing the gyro from reporting the spacecraft’s small movements. 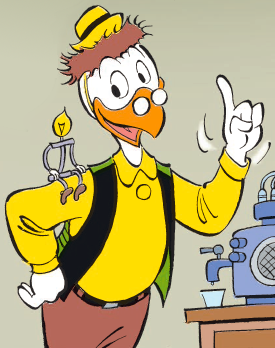 <<Gyro Gearloose is an anthropomorphic chicken created by Carl Barks for The Walt Disney Company. He is a friend of Donald Duck, Scrooge McDuck and anyone who is associated with them. In an attempt to correct the erroneously high rates produced by the backup gyro, the Hubble operations team executed a running restart of the gyro on Oct. 16. This procedure turned the gyro off for one second, and then restarted it before the wheel spun down. The intention was to clear any faults that may have occurred during startup on Oct. 6, after the gyro had been off for more than 7.5 years. However, the resulting data showed no improvement in the gyro’s performance. On Oct. 18, the Hubble operations team commanded a series of spacecraft maneuvers, or turns, in opposite directions to attempt to clear any blockage that may have caused the float to be off-center and produce the exceedingly high rates. During each maneuver, the gyro was switched from high mode to low mode to dislodge any blockage that may have accumulated around the float. Following the Oct. 18 maneuvers, the team noticed a significant reduction in the high rates, allowing rates to be measured in low mode for brief periods of time. On Oct. 19, the operations team commanded Hubble to perform additional maneuvers and gyro mode switches, which appear to have cleared the issue. Gyro rates now look normal in both high and low mode. Last week the operations team commanded Hubble to perform numerous maneuvers, or turns, and switched the gyro between different operational modes, which successfully cleared what was believed to be blockage between components inside the gyro that produced the excessively high rate values. Next, the team monitored and tested the gyro with additional maneuvers to make sure that the gyro was stable. The team then installed additional safeguards on the spacecraft in case the excessive rate values return, although this is not anticipated. On Thursday, the operations team conducted further maneuvers to collect gyro calibration data. On Friday, Hubble performed activities similar to science observations, including rotating to point at different sky locations, and locking on to test targets. The team completed all of these activities without issue. Late Friday, the team began the process to restore the scientific instruments to standard operating status. Hubble successfully completed maneuvers to get on target for the first science observations, and the telescope collected its first science data since Oct. 5.